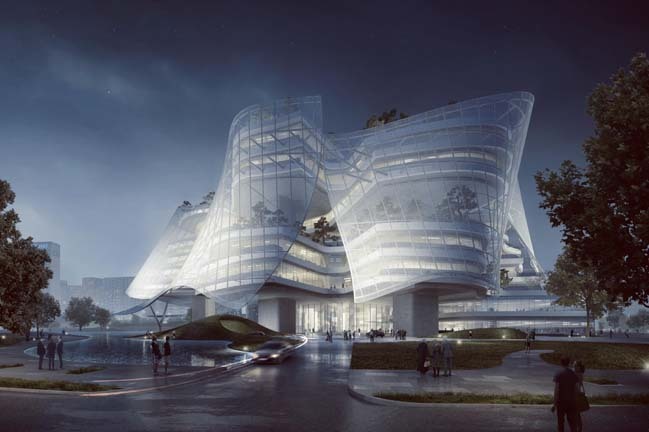 Xinhee Design Center is the international fashion group in Xiamen, China that was designed by global architecture firm MAD to create a building with skin-and-bones. 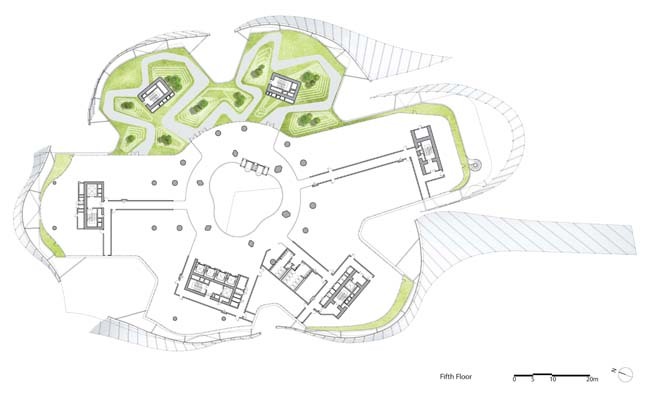 As an innovative and creative office, the spatial organization mimics six petals, growing from a central point. Each of the six brands have their own individual office and research space, yet can freely interact and communicate between departments. 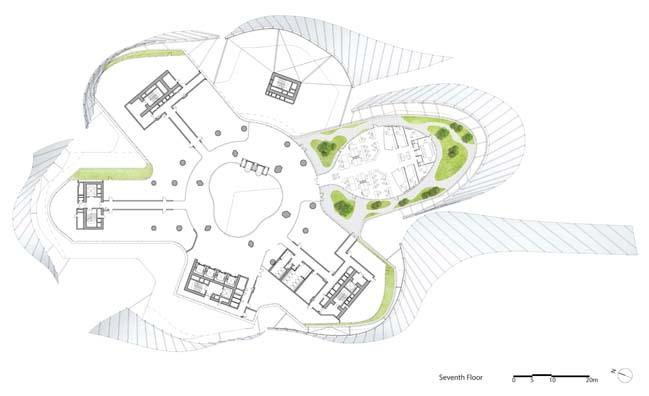 Unlike traditional corporate “boxes,” a radial layout enables the office space to be highly efficient and flexible, while at the same time provide natural light, ventilation, and vista. The atrium acts as public space that is open to staff and visitors. The atrium’s footbridge provides air circulation, and doubles as a catwalk for occasional fashion shows. 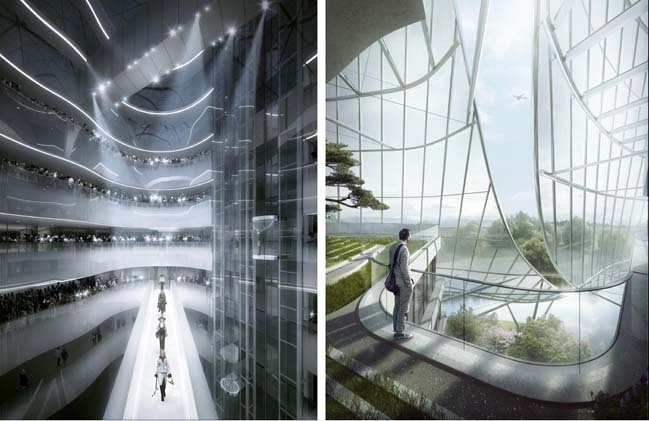 The two glass elevators in the atrium visually connect the office on different levels. 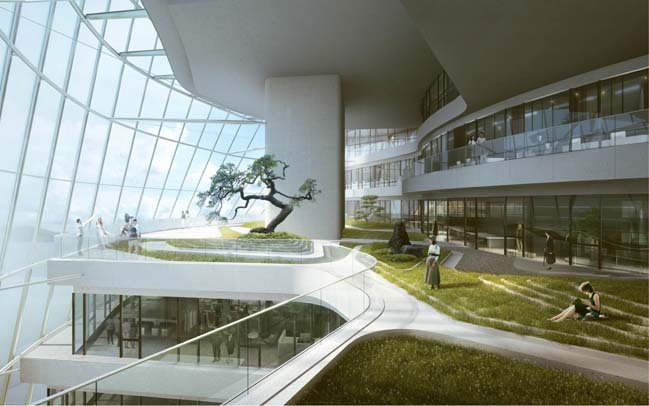 The connection between interior and exterior space extends the design center’s public interaction from inside office space to the outside gardens, and provides a relaxed atmosphere and working environment, while simultaneously creating a strong centripetal force. 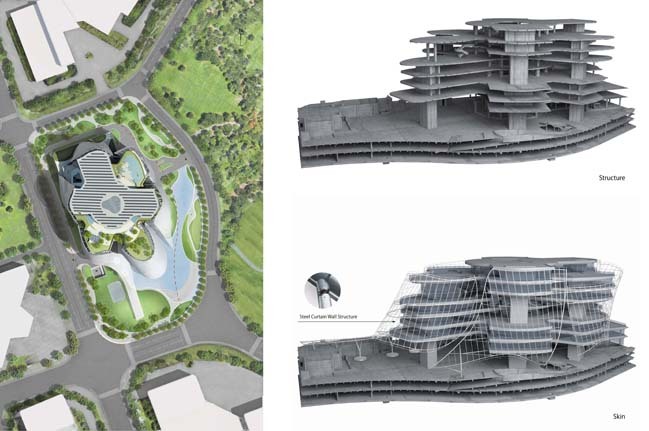 The design center is a highly efficient green building that adapts to the local climate. 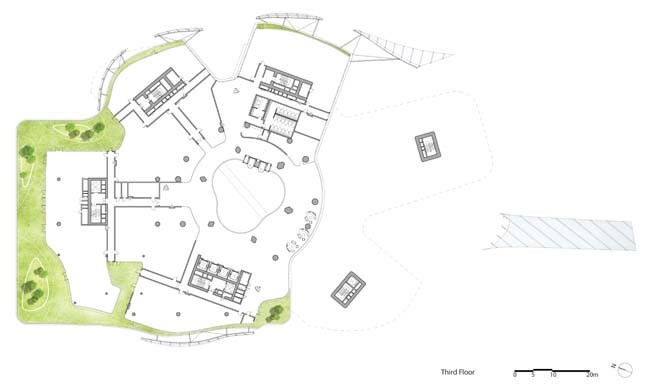 The void and lifted structure on the first floor reduces the footprint by two-third. 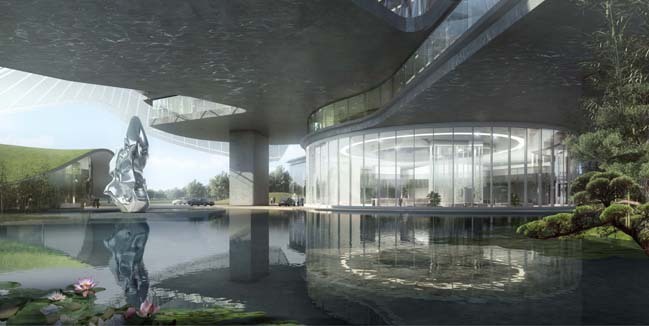 An urban environment, the first floor mainly consists of garden and water features, which are open to the public. 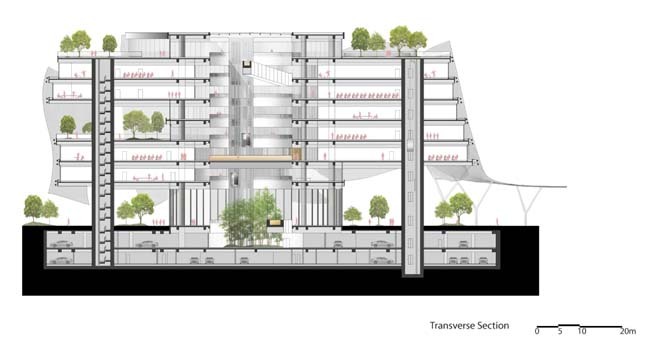 Both the atrium and the lifted structure enables ventilation throughout the building. The summer months deliver cool air to each level, versus the winter months when the atrium transforms into a sun-filled greenhouse below the glass-enclosed roof. 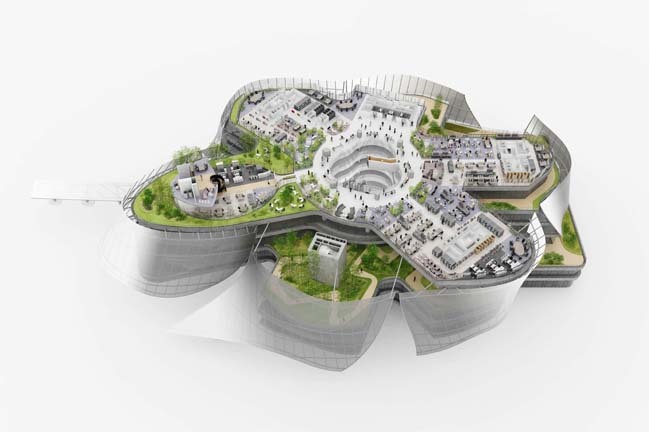 The stacked gardens create a 100% green ratio. 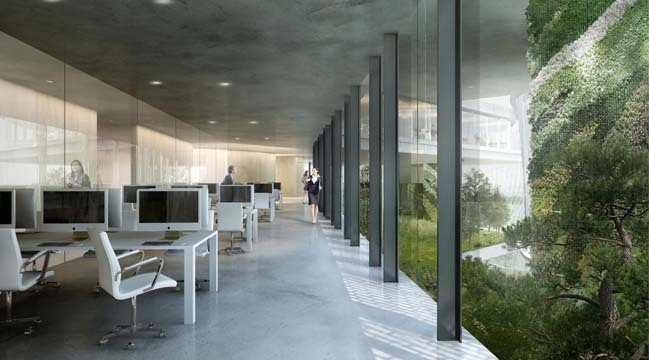 To lower solar radiation and provide natural lighting to the office, a translucent coating is applied to the building’s façade which permits 40% light transmittance. Solar panels line the rooftop, providing electricity for daily operations. 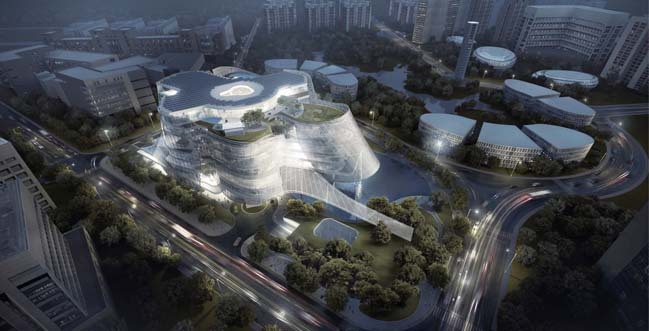 Xinhee design center is currently under construction and is expected to be in-use in 2017.